In a world where everyone is thinking outside the box, who needs a straight-out-the-box solution? Rediscover the freedom of collaborating in SharePoint and Office 365, without the risks and pitfalls. Move, manage, and protect your invaluable content. Enjoy Microsoft SharePoint, Office 365, and Exchange to the limit and beyond. 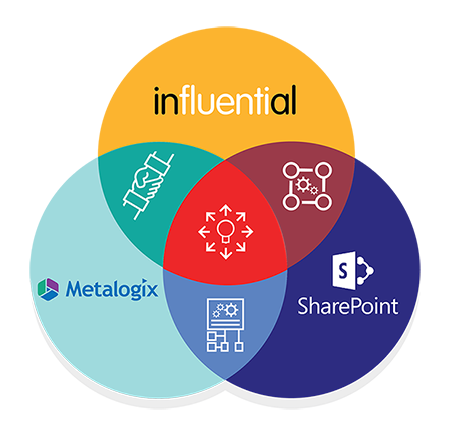 Trust in the Influential-Metalogix partnership to deliver the Office 365 solutions and SharePoint solutions that make your business thrive. At Influential, we know that rapidly evolving markets demand finely tailored software. With 25 years of experience in the sector, we have passed the test of time – with much more to come. Take our partnership with Metalogix, the Microsoft migration specialists. We deliver cutting-edge SharePoint, Exchange, and Office 365 solutions that are defining the future of content infrastructure worldwide. Discover the freedom to collaborate on any platform, with none of the risks. With Quest’s acquisition of Metalogix in June 2018, these leaders in Microsoft solutions have brought their strengths under one roof. That’s another reason to join the 120,000 clients who have empowered their businesses with Metalogix and Quest. Combined with Influential’s decades of successful service, your business has everything to gain. The Metalogix SharePoint and Office 365 solutions are versatile by design. Whether synchronising content across continents, streamlining data retention for efficiency, expanding backup and restore capabilities or saving millions on data migrations, these tools are tested by the best. 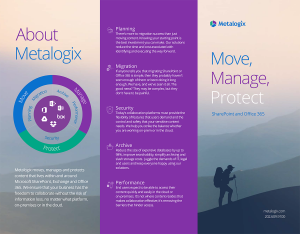 Explore the unique offerings for each Metalogix environment, including Office 365 solutions and offerings for SharePoint and Exchange. Content Matrix: Enable users with the most trusted migration solution for over 15 years. Essentials for Office 365: Empower managers with one console to manage permissions, gather intelligence on user adoption, and move and reorganise content. Content Matrix: Make SharePoint migrations simple with full enterprise features. ControlPoint: Simplify SharePoint security, administration, and governance. Diagnostic Manager: Ensure SharePoint platform performance with automated monitoring. SharePoint Backup: Protect SharePoint from the risk of lost and exposed data. Restore Point: Guard against accidental data loss and restore from database backups. Metalogix Expert: Gain insights to plan a successful migration in SharePoint. Sensitive Content Manager: Use advanced Machine Learning to accurately find sensitive content. Replicator: Connect and synchronise content between offices across the world. Need SharePoint Migration or Management Solutions? Archive Manager Exchange: Reduce email data storage needs while searching for emails effectively. Content.ly: Control content across platforms such as Microsoft Office 365, Slack, Salesforce, Box, Dropbox, and Google for Work. Archive Manager Files Edition: Benefit from automatic and cost-effective file storage. StoragePoint Content Storage: Externalise content to high-performance storage at low cost.